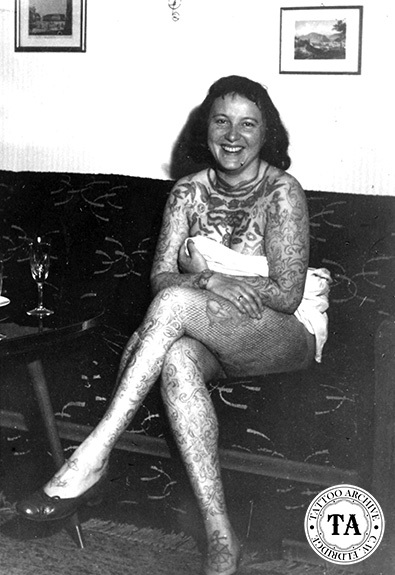 German attraction, Lyda Akado was billed as, "The New Look in Tattoos" when she appeared with the Ringling Bros. Barnum & Bailey Circus (RBB&B) in 1954. Lyda Akado was the stage name of a Mrs. Bohrman who was tattooed by German tattooist Hans Ullrich in a style that could best be described as Japanese/American/German meets art deco. A Japanese style geisha for her back piece framed by art deco style flourishes. Panthers and cobras on her legs with unique German style fish nets tattooed over them. Hans Ullrich and his wife Ruth were popular in the tattoo world in the 1940s and 1950s and corresponded with other tattooists and fans around the world. 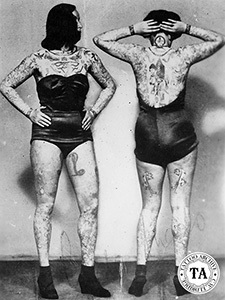 They were both proud member of the Tattoo Club of America; Ruth was the president of the German Ladies' Tattoo Club and a member of the Butterfly Club. The Ringling Bros "New Look" extended beyond Lyda Akado and her tattoos. The 1950s was the end of an era for the great-tented railroad circus. It was becoming more and more difficult to find locations in the cities big enough to pitch all the tents that these shows required, so circuses were forced to move further and further away from city centers. The cost of moving those tented cities daily just became too much. New larger auditoriums and facilities that could house these circuses were being built and toward the end of this period, Ringling started to streamline and modernize their shows. One of these changes was the look of the midway. For decades the sideshow tent was fronted by a series of large canvas banners that depicted the acts you would see inside the tent. Because of their size these banners could be seen across the circus lot and would draw the patrons to the sideshow/circus entrance. These huge banners were a handful to put up and take down everyday. 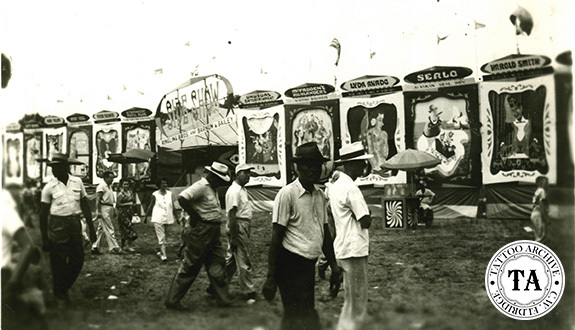 During the 1950s, Bill Ballantine was hired by the Ringling Bros. to redesign the midway that included sideshow banners and menagerie cage designs. At this time Ballantine was a well-respected illustrator, writer and professional clown, who would later serve as the dean of the RBB&B Clown College. Bill Ballantine's new sideshow design was a major labor saving idea that did away with the canvas banners and all the rigging that went with them. The top of the metal wagons that carried the sideshow gear had hinged panels mounted to them. These panels were painted just like the canvas banners, to depict the acts that worked in the sideshow. On the lot these special wagons would be placed in front of the sideshow tent and the painted panels would be unfolded to create the banner line. When the wagons were in transit these panels could be folded against the wagons and covered with heavy canvas to protect them. These metal banners were done in a shadow box style with each attraction's stage name at the top. The wheels of the wagons were covered with canvas to give the illusion that the metal banners were suspended, like the canvas banners of old. RBB&B produced their last show under canvas on July 16th, 1956 but these sideshow banner wagons did get some use with the indoor shows. This was the beginning of the end for sideshows as they had been seen in the past We were just in Sarasota FL (Jan 2010) at the Ringling Museum and they had some of these Ballantine designed wagons on display.